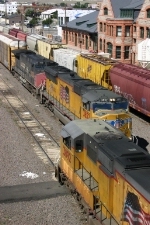 Description: One of 3 UP SD70MAC's running together in Hamlet Yard. Description: The leader of 2 other SD70MAC's seen together in Hamlet NC. Description: Five locomotives pull west to snowy Meacham Summit and then down to Pendleton. Title: UP 3892 at Eureka Jct. Description: Photo overexposed but used to document location of UP 3892 on 11/27/2006. Unit leads three other units eastbound with general freight. UP Huntington Sub. 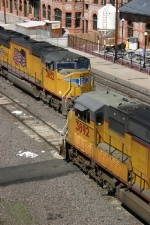 Title: UP 3892 at Santa Fe Jct. Description: Very short Stacker Train. Description: M-EADM heads down the ex-RI Spine Line to Des Moines. Description: A northbound intermodal train starts up the Mt. Vernon Subdivision. 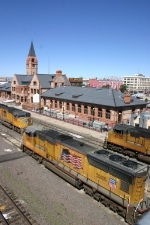 Description: A northbound intermodal train at Bush.